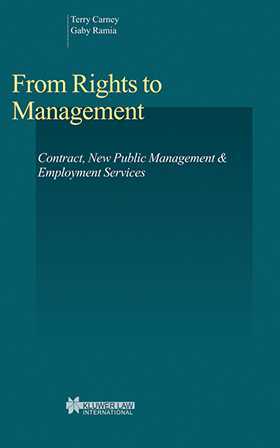 From Rights to Management presents a powerful and thoroughly documented new thesis about the transformation of the concept of work during the period 1970-2000. The authors remind us of what we now easily forget: that, not so long ago, the right of an unemployed person to social security benefits and services was not questioned. Over the years, this right has been gradually replaced by a two-way bargain with the state. And in the place of this old 'social citizenship', there has arisen a government-corporate alliance that manages job seekers by contract. The shift from the needs of the person to the demands of business is complete. Those tempted to argue with this provocative thesis will find a formidable array of evidence assembled in this well-researched book. Focusing primarily on Australia--where the marketisation of welfare and employment services has gone farther than in any other country--Professors Carney and Ramia draw not only on the recent literature of several relevant disciplines, but also on in-depth interviews with thirty unemployed people from a wide range of backgrounds and situations. By assessing the inner workings and impacts of public management transformations on the lives of those most deeply affected, the authors provide a keen understanding of how the management theories, initiatives, and pretexts--economic and legal--work out in actuality. The interdisciplinary discussion incorporates debates about civil society, social capital, and other germane topics of great concern to scholars, policymakers, and administrators in this era of globalisation. A deep analysis of the new policy network of social services examines the types of contracts that govern the various parts of the system. The analysis concludes with a proposed new framework that reinstalls citizenship as the basis for welfare policy, but in a way that places real obligations and accountability on government and does not leave disadvantaged persons to fight a losing battle. No lawyer, professional, academic, or official in the social policy environment can afford to ignore this challenging work. Preserving Welfare Citizenship Within Markets?